There is one thing that is really helping me during these challenging times and that is eating simply. Wartime rationing has taught me how to do this, I can eat simply and healthily and extraordinarily cheaply. But looking at my diet today, its been practically chemical or processed food free which has to be a good thing doesn’t it? We DO have a choice what we put in our mouths and we can eat a fairly nutritionally balanced diet cheaply if we take the time to prepare and cook. It’s not easy I know, hell I struggle quite often, but it’s doable. And doable is keeping me healthy and helping me hang on in there financially while I can’t get a job here in Canada. If it’s doable, I’ll take it! There are occasions when I am touched so deeply by the kind actions of others that I feel unable to quite know what to say..
Let me tell you, when one reads words like that, it moves you to tears. That someone has honestly felt these things and has taken the time to share those thoughts. It’s humbling to witness the capacity within the human spirit of selflessness and love towards a stranger in a way… I think we have many, many special people that surround us on our lovely planet. 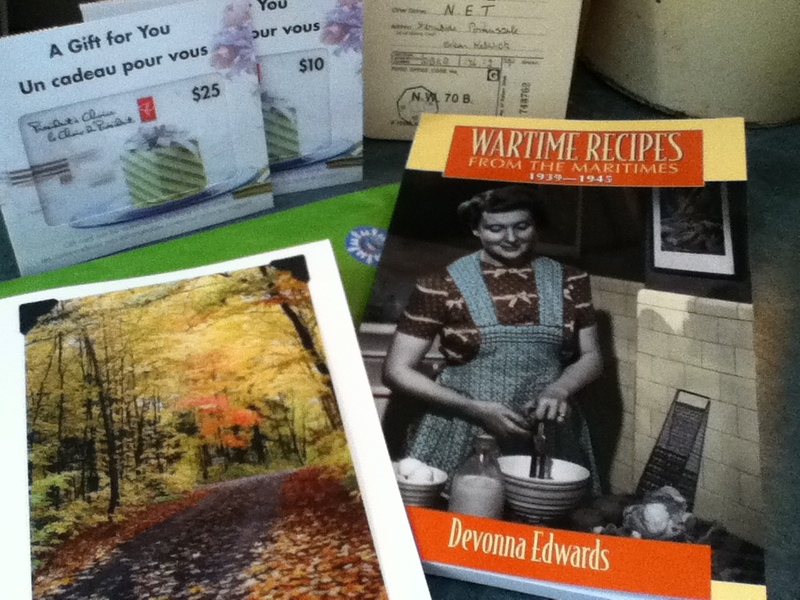 As if the words, were not heart-warming enough there was not only some grocery gift-cards (which are being put away for our 1940s Christmas) BUT a fabulous cook book by Devonna Edwards called “WARTIME RECIPES from the Maritimes- 1939 – 1945”. I’ve already picked it up several times in the past 30 minutes as I type this! 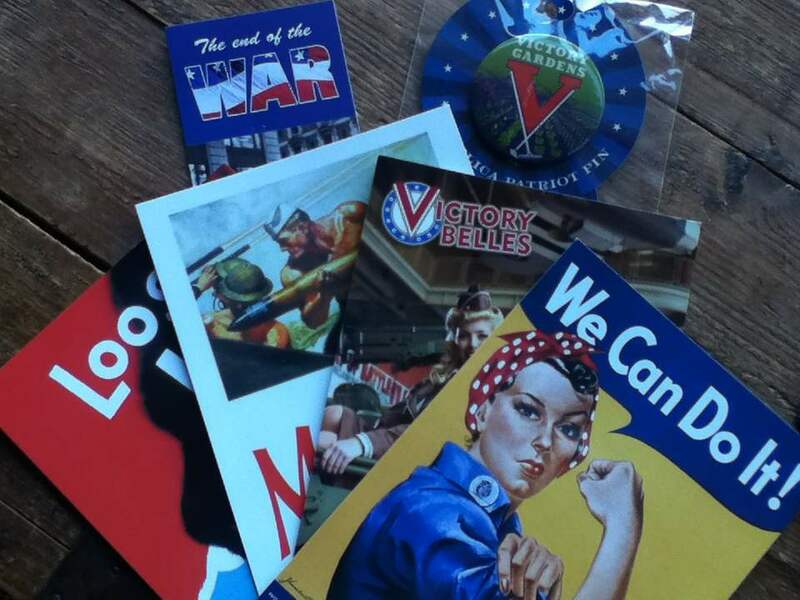 I will cook up many of these recipes on my blog..
And a few weeks ago, a dear pen-friend from the US sent some wartime postcards and a “Dig for Victory” pin. I wasn’t expecting that, it was so very thoughtful.. I have a special box for my wartime things, I tend to squirrel them away then occasionally spend an evening, when it’s quiet, looking through everything and letting my thoughts travel back in time while listening to wartime music, speeches, air raid sirens, and public information announcements. One should never forget the hardship and sadness experienced by Sons and Daughters, Mums and Dads, Grandmothers and Grandfathers, all over the world, during the Second World War. We should also celebrate the bravery, ingenuity, and great spirit of all those who endured the austerity and heartbreak with a determined smile. We should remember, so our governments, never ever put it’s people through a war, like this, again.. While one cannot even comprehend the hardship faced by those living through this time period, Christmas was always a day to look forward to, a day for the children, a day of celebration, despite food shortages and loved ones far, far away. I feel in our modern age, young families, who can ill afford vast sums of money, are pressurized to provide gifts, to children and immediate family members, that place intolerable financial burdens and stresses in the post- Christmas period. Living in a consumer society, we can be deemed odd or our children pitied for parents NOT complying to what is perceived to be the 21st century NORM. Where have those good old-fashioned Christmases gone where it was less about the gifts and more about being together as a family, having fun, showing our love, a time where our children left a note for Santa and asked for one simple toy, something they would hold on to and treasure? To me Christmas is about spending a day being happy, being grateful, feeling loved and wanted, warm and cosy and smiling. 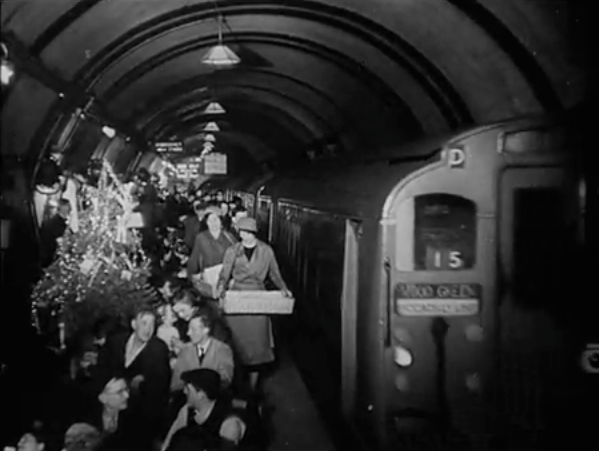 So on Christmas Day 2012, my family and I are transporting ourselves back to Christmas Day 1940, the first Christmas on wartime rations, to enjoy an old-fashioned Christmas full of nostalgia, devoid of excess (ours are normally anyway)and full of hope and joy. 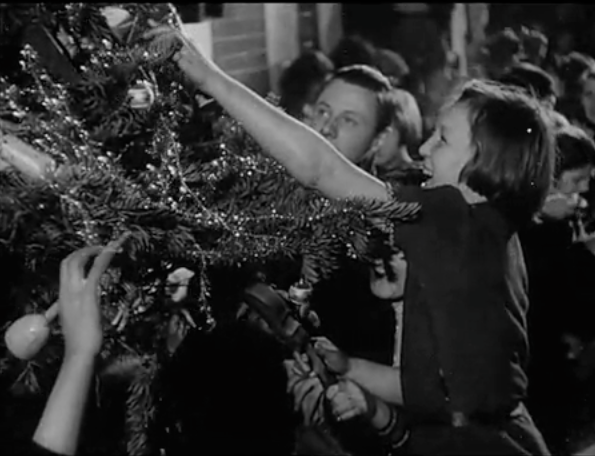 We’ll make our decorations, we’ll have a short tree, the children will have a small chicken and a slice of ham, we’ll make a wartime ration book christmas pudding and christmas cake, play 1940s music, lay the table with 1940s tableware, listen to Christmas speeches and open a bottle of Emva Cream Sherry and get rosy cheeked after playing some party games..
I’m rather excited by it all and I’m putting away some of my rations to ensure we have enough goodies to have a really nice day.. 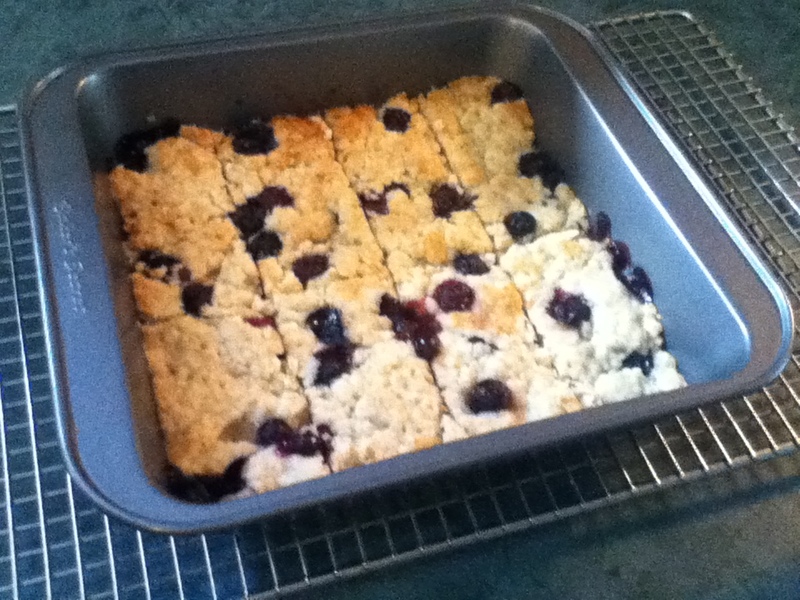 Note: Being vegan this is a very easy recipe to adapt. Use an organic vegan margarine (so avoiding Monsanto’s GMO soy beans) and if you dislike using a refined sugar there are many unrefined raw alternatives in most stores. First let me say thank you once again for the fantastic comments left on the blog and for the e-mails received. I have read them all and WILL get around to responding as all of them warrant a full and proper reply. Am still trying to cope with a HECTIC schedule (thank goodness I do not have a job!) of urgent paperwork (and there is reams of it), personal issues and just trying to damn well make a living! I am writing this taking a break from some paid article writing that has come to me from the UK. 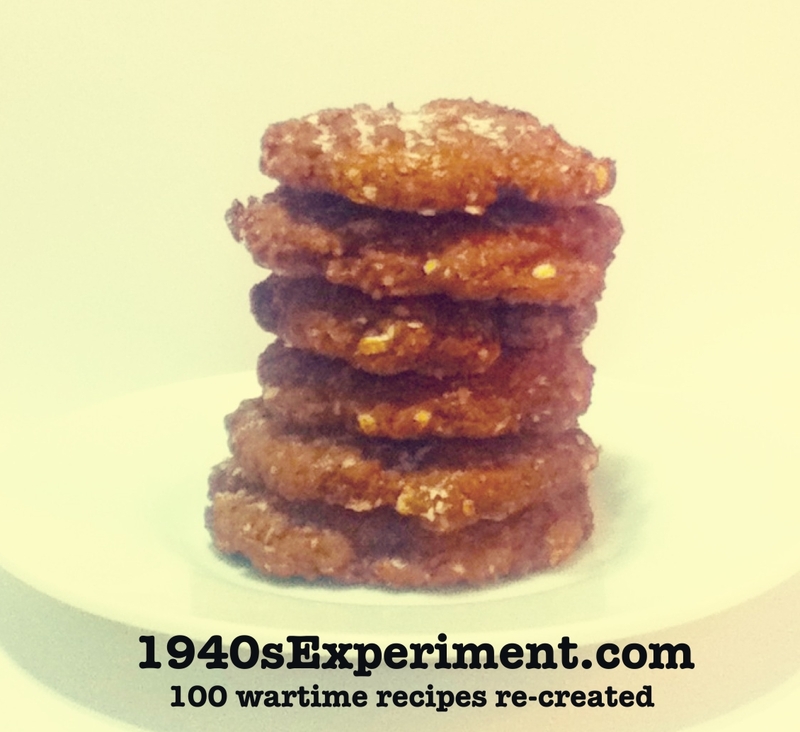 On that note, I have now re-created 98 wartime recipes and you’ll love the final two coming up based on VE Day celebrations so those will come to you in the near future..
CLICK HERE FOR ALL 98 WARTIME RECIPES RECREATED TO DATE!! I haven’t exercised, apart from a few walks, for the past few weeks because of dealing with so many other things but I am determined to continue on as soon as I can and repeat my Couch to 5K program (jogging) from scratch NOT using a treadmill, I yearn to run, I love that feeling. Despite not exercising my weight is dropping slowly and I am making a new goal of FINALLY getting to 199lbs (100 lbs off since October 2011) on a Christmas Eve weigh in… I need a goal and I think that is a tough but realistic one. This would be my best Christmas present ever..
Well my tea break is over, I’d better return to my article writing. 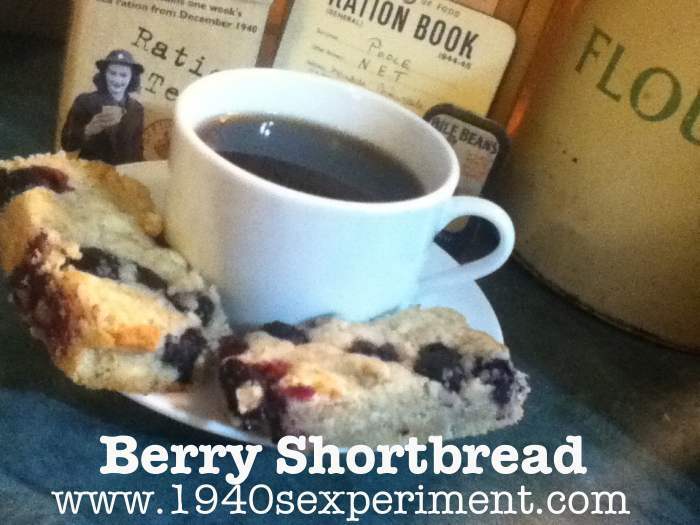 These are excellent biscuits/cookies for children. 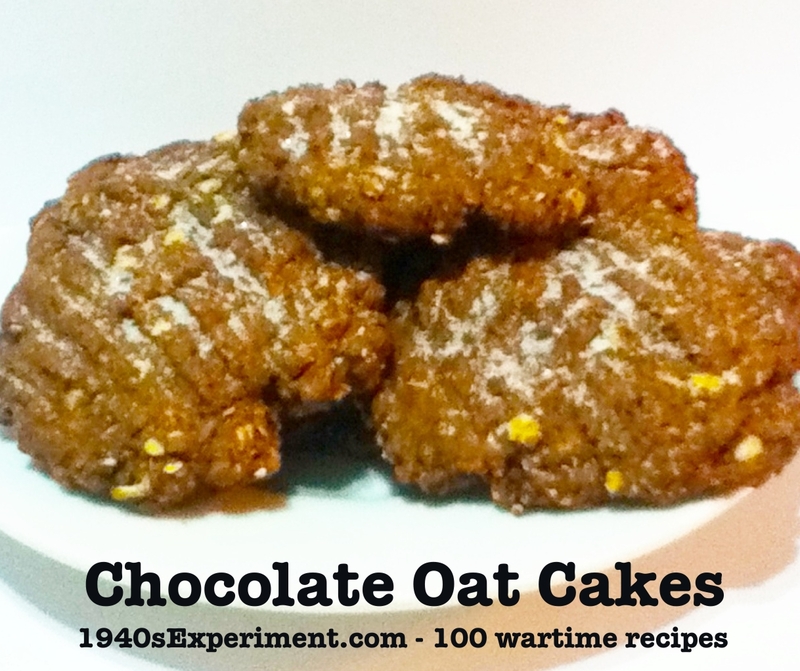 As cookies go they are low in fat, relatively low in sugar and have lots of rolled oats in them. 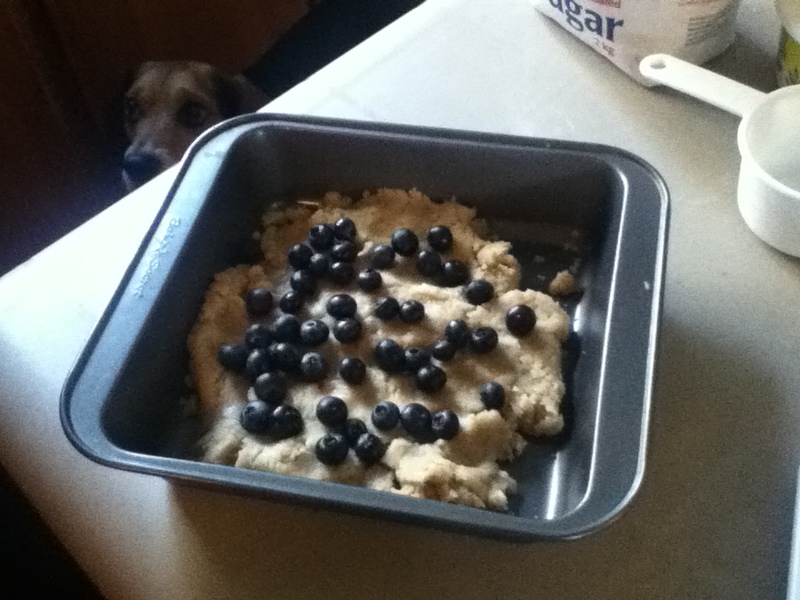 My grown up kids all enjoyed them, and the dog… and as I share this recipe with you, I’m enjoying my second one and thinking I should wrap them up and stick them in the freezer before I eat the 25 that are left. I like recipes that are easy peasy, quick and tasty and utilize ingredients most of us would find in our kitchen cupboards at anytime. 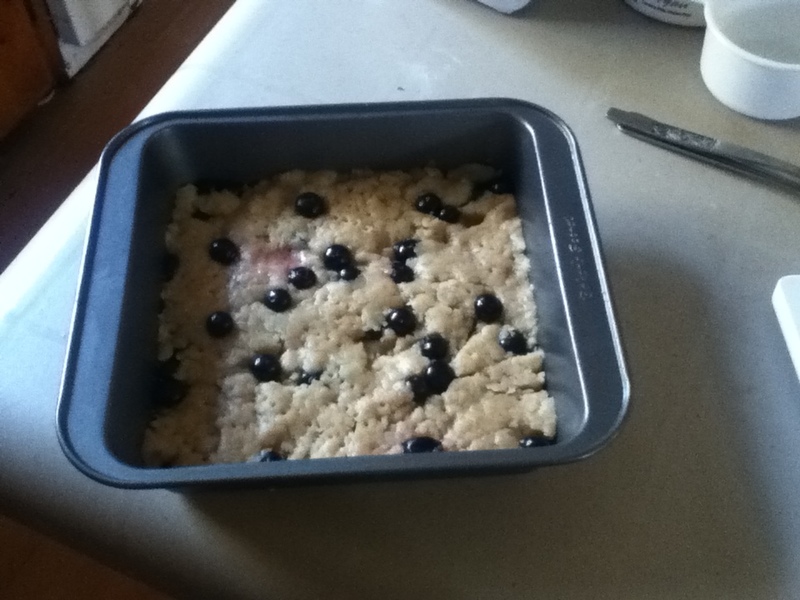 This one fulfills that criteria..
Bake in an oven at 190C (380F) for about 15 minutes until golden brown. The early weeks were full of distractions and stresses of an unknown future but as time has passed by, the kids and I have something tangible on our horizon, we just have to knuckle down and get the appropriate paperwork completed. Yes we have a deadline and that’s why I’ll be chained to my computer all this afternoon. There are real concerns and worries when you are unable to work for any employer in the country in which you live, when you have no health coverage or no financial assistance in any form to feed yourself or your family. I’m not looking for sympathy or anything else here but just stating the facts. They need to be spoken. The few months while we wait for our new work and study permits will seem like a lifetime. It’s not ALL doom and gloom though. I recently was given the opportunity, by a Facebook friend in the UK, to write 10 web articles for a days pay. The subject …….LUXURY SKI RESORTS. As I know nothing about skiing and have not acquired the necessary skills to say focused on one task, instead of taking an hour an article, each one took 2-3 hours including research. Although I was frustrated by my inability to deliver to a specific deadline, I was rather pleased that I had managed to formulate some accurate, factual articles. A small success. I will have another 10 articles to write on specific herbs this weekend, I know my herbs, this will be easier..
Onwards and upwards… time to go shopping and then an afternoon of immigration type paperwork!